Multnomah County could get $254 million for affordable housing projects if bond passes at Nov. 6 general election. Without coming right out and saying it, Metro is working to avoid a problem with Portland's affordable housing bond if its own measure passes at the Nov. 6 general election. The Metro Council held a work session on the process for spending the bond funds on Sept. 18, almost two months before voters in the urbanized portions of Multnomah, Clackamas and Washington counties will decide whether to approve Measure 26-199. Although that may seem premature, discussions between staff members from Metro and those governments that could receive the bond funds actually started before the council referred the measure to the ballot. "This is really an unprecedented opportunity for the region," said Central City Concern Chief Housing Strategist Sean Hubert, who helped compile the list, which is confidential because some potential projects are in very early stages. No one at the work session criticized Portland for its handling of the $258 million affordable housing bond approved by city voters at the November 2016 general election. But the issue has loomed over Metro's measure. Its opponents, including Washington County Chair Andy Duyck, have repeatedly cited what they call "delays" in the city's spending to demonstrate governmental inefficiency. Portland officials have repeatedly said they are well underway to producing the 1,300 units of affordable housing promised if the measure passed. But anyone who followed the process knows that Mayor Ted Wheeler paused it after he took office in January 2017 and appointed an advisory board to recommend a framework for spending the money. It took many months of meetings to produce the proposal finally approved by the council last October, nearly a year after the measure was approved. In contrast, Metro is trying to establishing its spending framework before the measure passes, which has been challenging because it is much more complicated. The city's bond money is being spent by one of its own agencies, the Portland Housing Bureau. But Metro is not a housing agency and so will have to distribute most of its bond funds to other governments. 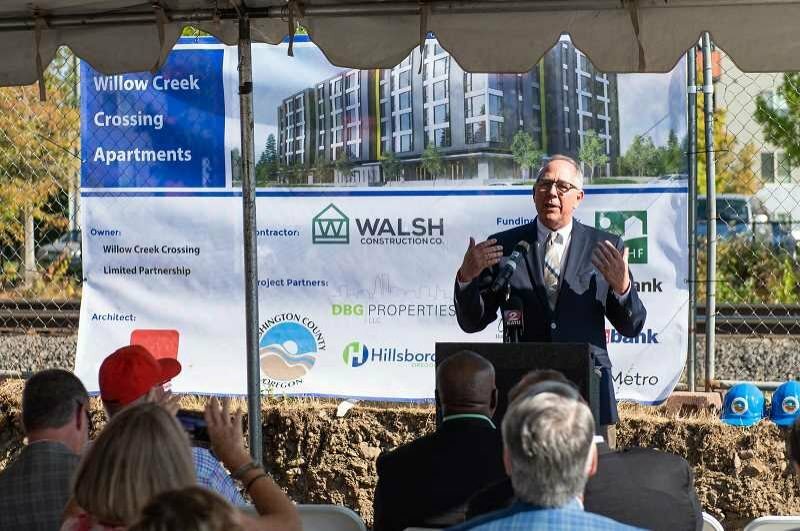 They will be the public housing authorities in all three counties and four cities eligible to receive federal Housing and Urban Development block grants, which are Beaverton, Gresham, Hillsboro and Portland. The housing authorities have the ability to build projects anywhere within their counties, so some will likely go into non-block grant cities, like Oregon City. But Metro has set some minimum requirements. Among other things, the sites must be zoned for such developments and be large enough to accommodate 50 units. Lake Oswego Mayor Kent Studebaker, who opposes the measure, says there is no such available land in his city. Although many organizations have endorsed the measure, the complexity prompted the Clackamas County Chamber of Commerce and the East Metro Economic Alliance to remain neutral.